Tupperware is closing down its UK party sales business with the loss of nearly 1,700 jobs. The company has made a huge success out of selling its food storage boxes through parties in people's homes. But it says that in the UK customers seem to have gone off the idea of buying goods in this way. So, instead, it is going to concentrate on selling directly to shops or through alliance agreements with other businesses. 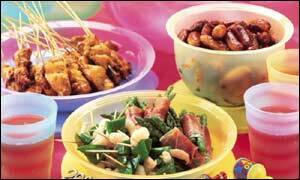 The company said that 1,500 tupperware demonstrators, 160 managers and 20 distributors would lose their jobs. The US based business did not make a formal announcement but it contacted its staff on Tuesday to tell them it would be discontinuing party plan sales in the UK at the end of March. "What we found was that as times were changing we needed to take account of consumers likes and dislikes," Jane Garrard, vice-president of Tupperware investor relations told BBC News Online. "We believe there's still a very strong demand for our product it's really just the manner of distribution." She said that in the US and elsewhere in Europe tupperware parties would still be part of the business.